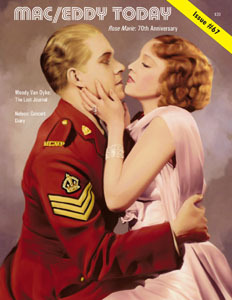 Our Jeanette MacDonald and Nelson Eddy magazines complement the book Sweethearts, going into more detail about various aspects of their lives, extensive photo features in each issue, interviews with some of the sources for Sweethearts, comprehensive reviews of Nelson and Jeanette’s singing careers, movie treatments for films they never made, book and CD reviews, and eyewitness accounts from fans, co-workers and friends. All important research can be found in the magazines. To order any remaining glossy originals of our magazines, click here for what is still available. All other back issues can be ordered in the book compilations. Below is the list of all Issues. # 1: The Early Years, their lives and careers pre-MGM. # 2: NAUGHTY MARIETTA (1935), the details behind the filming of their first film together. # 3: ROSE MARIE (1936); their engagement and break-up. # 4: Nelson’s 1936 concert tour, Jeanette in SAN FRANCISCO, her “feud” with Clark Gable. # 5: The first Technicolor MAYTIME (1936); starring Jeanette, Nelson, Frank Morgan and Paul Lukas. # 6: The second MAYTIME (1937), starring Jeanette, Nelson, and John Barrymore, part 1. # 7: The second MAYTIME, part 2. #10: SWEETHEARTS (1938), part 1; Jeanette’s pregnancy by Nelson. #11: SWEETHEARTS, part 2; Jeanette’s miscarriage and break-up with Nelson. #12: LET FREEDOM RING (Nelson, Virginia Bruce, 1939); BROADWAY SERENADE (Jeanette, Lew Ayres, 1939); the truth about Nelson’s marriage. #13: BALALAIKA (Nelson, Ilona Massey, 1939), Miliza Korjus interview, Jeanette’s reaction to Nelson’s marriage. #14: NEW MOON (1940), part 1; the original film directed by Woody Van Dyke, co-starring Buster Keaton. #15: NEW MOON, part 2; Robert Z. Leonard takes over as director and changes cast and script. #16: BITTERSWEET (1940), and why Noel Coward “disowned” the film. #17: THE CHOCOLATE SOLDIER (Nelson, Rise Stevens, 1941); SMILIN’ THROUGH (Jeanette, Gene Raymond, 1941). #18: I MARRIED AN ANGEL (1942), part 1; the scenes that were cut from the final print. #19: I MARRIED AN ANGEL, part 2. #20: I MARRIED AN ANGEL, part 3, and the real reason the team left MGM. #21: Pictorial tribute to Woody Van Dyke, their director and friend who died in 1943. #22: PHANTOM OF THE OPERA (Nelson, Susanna Foster, Claude Rains, 1943); FOLLOW THE BOYS (Jeanette, 1944); and part 1 of the Susanna Foster interview. #23: KNICKERBOCKER HOLIDAY (Nelson, C. Dowling, Shelley Winters, 1944); Jeanette’s opera career; Susanna Foster interview, part 2. #24: The War Years, part 1; Jeanette’s breakdown, Frank Laric interview, part 1. #25: The War Years, part 2; Frank Laric interview, part 2. #26: NORTHWEST OUTPOST (Nelson, Ilona Massey, 1947); Jeanette’s career indecision. THREE DARING DAUGHTERS (Jeanette, Jose Iturbi, Jane Powell, 1948). #28: THE SUN COMES UP (Jeanette, Lassie, 1948); Jeanette’s heart attack; with Nelson on Kraft Music Hall. #29: The late 40s; their private and professional break-up. #30: The aftermath of the break-up; I MARRIED AN ANGEL revisited. #31: Nelson’s pre-film operatic career including reviews and interviews; SAN FRANCISCO and complete newspaper coverage of the 1984 battle to change that city’s official song. #32: Nelson and Jeanette candid photo feature; interview with Betty Jaynes (SWEETHEARTS co-star). #33: Starting new careers in 1950; interview with Lawrence Tibbett, Jr.
#34: The complete story behind MGM’s first Technicolor film, the “lost” MAYTIME, and why it was only 3/4 completed. Includes rare wardrobe shots, with Nelson aging from a teen through old age; Jeanette’s pregnancies. #35: On the set “candid” shots detailing the filming of the “lost” MAYTIME. #36: Scenes from the first MAYTIME, with plot and scene shots, including the second act of “Tosca” with Jeanette as Tosca and Nelson as Scarpia; also an interview with Rise Stevens. #37: The early ’50s; their careers and personal crises; interview with Herbert Gahagan, set designer on THE GUARDSMAN (Jeanette, Gene Raymond, 1950); LET’S GO NATIVE (Jeanette, Jack Oakie, Kay Francis, 1930). #38: The inside story behind the 1952 “This is Your Life;” photo features: NAUGHTY MARIETTA and THE LOTTERY BRIDE (Jeanette, 1930). #39: The ’50s, a sample of Nelson’s paintings, photo feature:OH, FOR A MAN (Jeanette, Reginald Denny, Bela Lugosi, 1930). #40: Jeanette and Nelson’s spiritual beliefs, including an article by Nelson; interview with psychic Phyllis Woodbury, who consulted with Jeanette shortly before Jeanette’s death; photo feature on PARAMOUNT ON PARADE (Jeanette, 1930). #41: The television years; the death of Nelson’s mother, Isabel Eddy, including her hand-written will; interview with opera great Rose Bampton; photo feature on DON’T BET ON WOMEN (Jeanette, Edmund Lowe, 1930). #42: The 1960s; ROSE MARIE revisited; celebrity interview with Miles Krueger, J/N Diaries, part 1. #43: The 1960s, part 2 of J/N Diaries; celebrity interview with a protege of Nelson’s. #44: Jeanette’s final days and death; excerpts from her will; pictorial tribute, Nelson interview. #45: Nelson’s final days and death, excerpts from his will; pictorial tribute, ANNABELLE’S AFFAIRS (Jeanette, 1931). #46: The Real MacDonald/Eddy Feud and the crisis of 1945; book reviews, photo feature on NAUGHTY MARIETTA, celebrity interview with Al Caiazza (the boy in PRIMA DONNA with Jeanette). #47: Why they never had children together. Club news around the world; photo feature on ROSE MARIE. #48: The story of Jon Eddy, Nelson’s illegitimate son, photo feature: LOVE ME TONIGHT (Jeanette, M. Chevalier, 1932). #49: Questions & Answers: Jeanette’s true birthdate, the truth about their marriages; photo feature on ONE HOUR WITH YOU (Jeanette, Maurice Chevalier, 1932). #50: “All Stars Don’t Spangle,” a movie treatment by Nelson for himself and Jeanette; CAT & THE FIDDLE (Jeanette, Ramon Novarro, 1933). #52: NAUGHTY MARIETTA, 60th birthday tribute; Jeanette’s will; Jeanette and Nelson: Saints or Sinners? #54: Photo features on THE FIREFLY and KNICKERBOCKER HOLIDAY; a TV script by Nelson; interview with Susan Nelson (Jeanette’s nurse at UCLA Medical Center), part one. #55: Photo feature on GIRL OF THE GOLDEN WEST, Susan Nelson interview, part two; the mystery of Jeanette’s Special Recordings” for Nelson, more Nelson scrapbooks. #56: “Czaritza” translation, photo features on ROSALIE and BROADWAY SERENADE; interview with Peggy Seo (of Jeanette’s KING & I, 1956). #57: Article on their mothers, Anna MacDonald’s will; photo features on LET FREEDOM RING and SAN FRANCISCO. #58: Insider write-ups about the incidents during Jeanette and Nelson’s concert days; photo features on NORTHWEST OUTPOSTand SMILIN’ THROUGH including a photo of Nelson on the set with Jeanette. #59: The mystery of Jeanette’s unpublished autobiography, includes xeroxed pages with Jeanette’s corrections and notations on the manuscript; more of Nelson’s scrapbooks with photos, clippings. #60: Special tribute to Lake Tahoe where ROSE MARIE was filmed including photo feature from the film and locations as they look today, interviews with those who remember the filming, etc. #61: Pictorial tribute to MAYTIME’s 60th anniversary, also ROSALIE and THE FIREFLY. Plus an article on the significance of 1937 in their lives. Also, more Nelson scrapbooks. #62: Celebrity interview with K.T. Ernshaw, author of “To Love Again,” and Nelson’s long-term girlfriend. Also, the Gene Raymond legacy, a write-up of nelson’s 1949 St Louis/Urbana Tour Diary, part one. #63: Reviews, articles and new information re: books such as “Hollywood Diva,” updated “Sweethearts,” “The Opera Years,” “Irving Stone Letters,” etc. Author K.T. Ernshaw answer readers’ questions. #64: Jeanette centennial issue; her contribution to history, pictorial tribute; Peggy Seo article re: The King & I. Nelson Eddy Drive dedication including a visit to “Mists” with photos; Nelson nightclub “Desert Song” skit with his written comments. #65: Nelson centennial issue; his contribution to history; pictorial tribute; Jeanette at home photo gallery; tribute to Dorothy Dillard and the story behind the Isabel Eddy letters. #68: The genealogy issue: The most complete and up-to-date information on their various family trees back to the 1600s. Discussion of Nelson’s relation to President Martin Van Buren, the birthdate on Isabel Eddy’s grave and the mystery surrounding Jeanette MacDonald’s paternal grandmother, Jeanette Johnstone. Plus, an interview with one of Nelson Eddy’s Kendrick cousins, George Hoge. Also Nelson’s 1949 concert diary, final chapter. #69: Comparison of the “first” Maytime to an earlier film, Viennese Nights; interview with Tod Jonson, close friend and producer of May Mann’s TV show (May briefly dated Nelson); Jeanette’s 1946 UK singing tour; Fredda Dudley Balling (Jeanette’s autobiography ghostwriter) on Nelson. #73: Nelson’s “I love you” handwritten letter to Jeanette from December 1935 and its back story; another smitten handwritten letter; Jeanette’s 1963 desk diary that provides damning evidence regarding Jeanette’s marriage to Gene Raymond, her failing health, the overall disinterest and abuse by Gene Raymond; Florence Bootin interview (seeing Nelson visiting Jeanette in the hospital); Isabel and Bill Eddy’s divorce papers in which young Nelson is discussed. #74: The Rise Stevens mid 1940s fiasco, Lake Tahoe visit documentation from 1948, Cat Clark interview, the divorce papers of Nelson’s grandmother, singer Caroline Kendrick. #75: Our 40th anniversary issue, part one. Jeanette and Nelson on TV together; The JAM project: Preserving a Legacy (of the remainder of Jeanette’s belongings); Nelson’s unpublished novel and its significance in verifying and clarifying facts in his life with Jeanette; Jeanette’s sister Blossom Rock: A Promise Kept. #76: Our 40th anniversary issue, part two. Celebrating MAYTIME’s 80th anniversary; a frank discussion of today’s fallen Hollywood mogul, Harvey Weinstein, vs LB Mayer and the moguls of Hollywood’s heyday, including Shirley Temple’s statement re: her casting couch experience at MGM; a comprehensive article by Darryl Winston about the history of our club; full color shots of some newly discovered paintings by Nelson as well as drawings, doodles and torsos of Jeanette; an eyewitness account of Jeanette’s live operas; Anna MacDonald (Jeanette’s mother) personal diary entries which give us more insight about her and Jeanette’s life as a young film star.